Monday night: Partial clearing. Lows in the 30s. 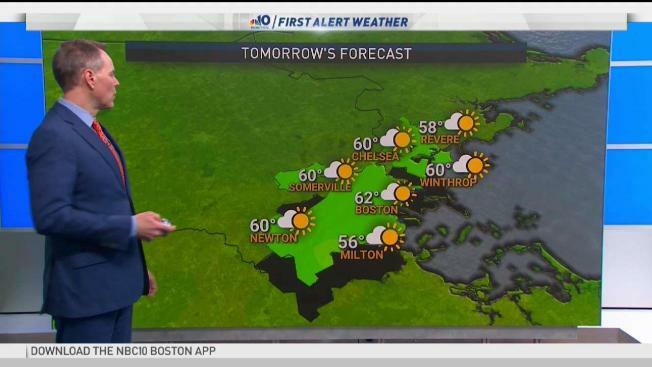 Tuesday: Mostly sunny. Highs near 60. The cold front has passed through Boston as runners wrap up a stormy and cool, warm and sunny, then rainy Boston Marathon. Our west wind has ushered in cooler temperatures this evening and the peak gusts are starting to get higher. Peak winds tonight will be between 40 and 50 mph from the west and that is why southern New England is under a wind advisory through Tuesday morning. Overnight lows will be around 40 with wind chills in the 30s. Upslope mountain snow continues across the mountains in northern New England, tapering off by tomorrow. Lots of sunshine is in the forecast both Tuesday and Wednesday with Wednesday being less windy. Highs both days will be about 60 degrees. A low pressure system approaches the northeast Thursday, and this system will swing in a warm front Thursday into Friday, elevating temperatures to near 70. The low may stall out before moving through, so a daily chance for rain continues through Easter Sunday. There is a chance that the rain clears out by afternoon with highs in the low 60s. An offshore low may bring in an onshore wind Monday through next Wednesday, creating cool, cloudy at times a rainy coast, while inland areas see warmer temperatures around 60 and drier weather.